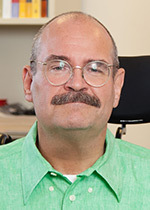 Kevin E. Bassler, John and Rebecca Moores Professor of Physics and Mathematics in the College of Natural Sciences and Mathematics and a principal investigator at the Texas Center for Superconductivity (TcSUH), was awarded a three-year, $324,000 grant from the National Science Foundation beginning in January 2016. This grant will support his research on non-equilibrium co-evolving complex systems. Bassler’s research attempts to understand the fundamental nature of the collective behavior of complex systems that emerge through the interactions of their constituent parts. Complex systems consist of multiple components that act in well-defined ways, but when combined behave in ways that are more than the sum of individual parts. Examples of complex systems are the Earth’s climate, strongly correlated electron systems, the human brain and social networks. “I’m interested in systems that are co-evolving, which means that two or more heterogeneous parts of the system are changing in ways that interact with each other. This nontrivial factor adds complexity to systems, yet by studying simple examples of co-evolving systems we hope to be able to develop a systematic understanding of them,” Bassler said. A major complication of studying complex systems is the fact that they are often driven away from equilibrium by exogenous forces and are thus, by nature, non-equilibrium systems. Non-equilibrium systems require a very different set of tools to understand their behavior. To study the behavior of non-equilibrium co-evolving complex systems, Bassler will focus on especially simple models of systems described by networks, including models inspired by social behavior, genetic regulation and biological speciation. Although the models that will be studied are simple, they nevertheless aim to capture the essence of the dynamics of a wide range of complex systems. “The advantage of studying simple network models is that they can be explored fully, both analytically and computationally, allowing the development of new insights into the fundamental behavior of complex systems,” Bassler said.